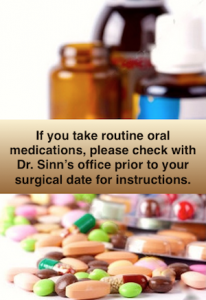 If you take routine oral medications, please check with Dr. Sinn's office prior to your surgical date for instructions. A patient should cease smoking at least two weeks before and two weeks after surgery. Smoking slows healing and contributes to complications. If you have an illness such as a cold, sore throat, stomach or bowel upset, please notify the office immediately. Please call Advanced Facial & Oral Surgery at 817-225-3223 if you have any questions.